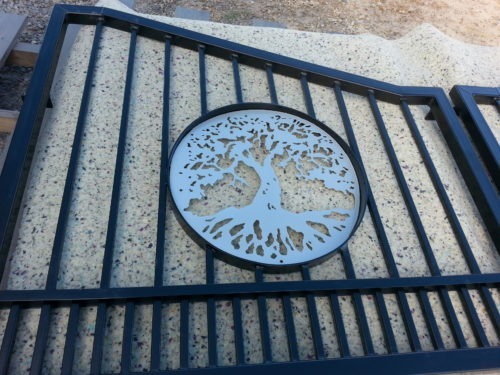 tree themed entry gates Archives - Custom Driveway Gates - Iron Steel & Aluminum - JDR Metal Art - FREE Standard Shipping! 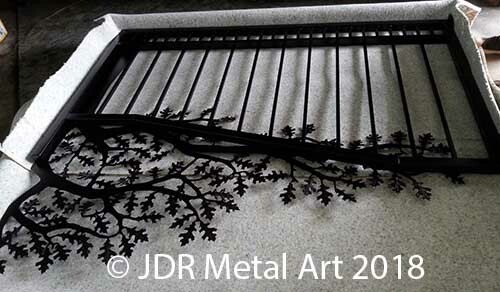 These dual swing driveway gates were custom designed by JDR Metal Art for an Indianapolis area residential entrance. 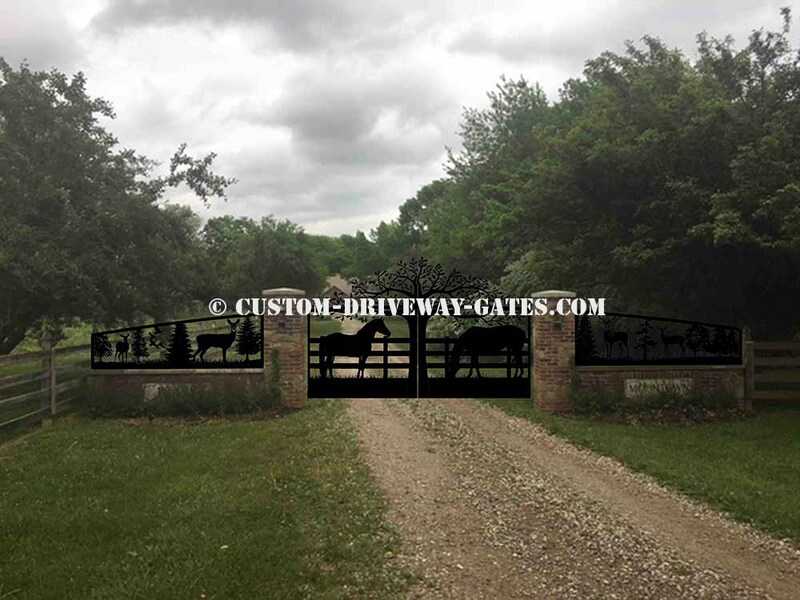 The gates feature arched top rails with steel plasma cut horses and an oak tree. The oak tree is roughly eight feet tall in the center. 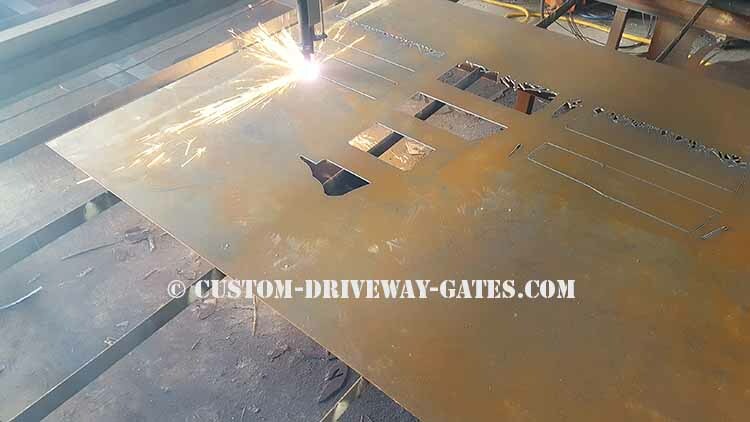 Each gate attaches to columns and are each 7′ wide and 5’6″ tall at the center of the driveway. 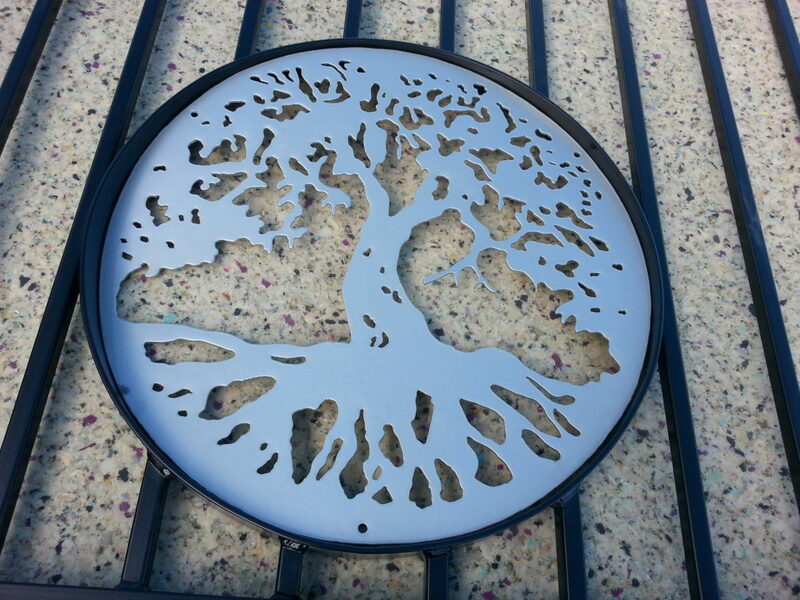 The artwork is all cut with a self-designed & built CNC plasma cutting machine. It is far more accurate and repeatable than when I used to cut with a hand held torch for many years. A computer running on the LinuxCNC program does all the motion movement controls as instructed by the gcode file that is created from the agreed design sketch. 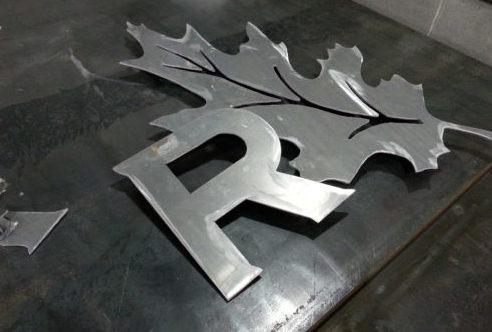 Exactly how the design looks is exactly what the machine will produce from raw material put on the cutting table. 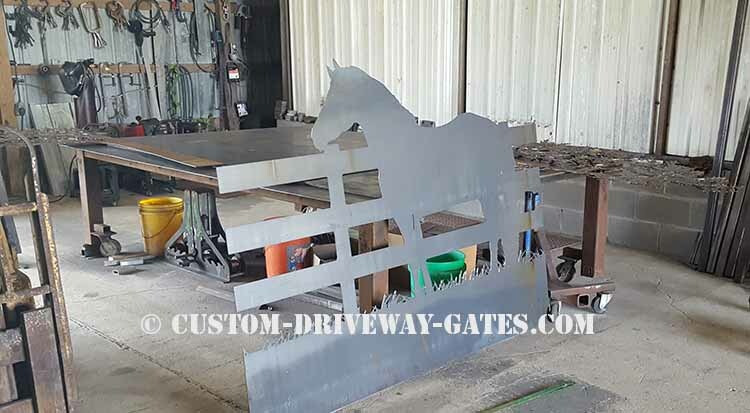 I like to use 1/8″ steel for the sheet cutouts because it is thick enough to be very durable over the long term while still retaining a more manageable weight for the gate opener to move over many thousands of open-close cycles. 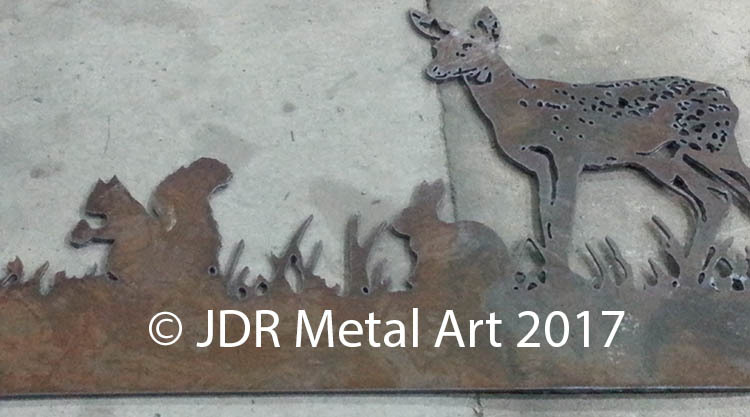 Plasma cut horse awaiting his newly framed home! 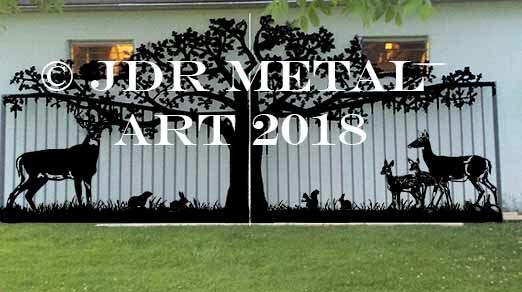 Custom metal art fence panels that are ten foot long by four foot tall grace the gates on each side. 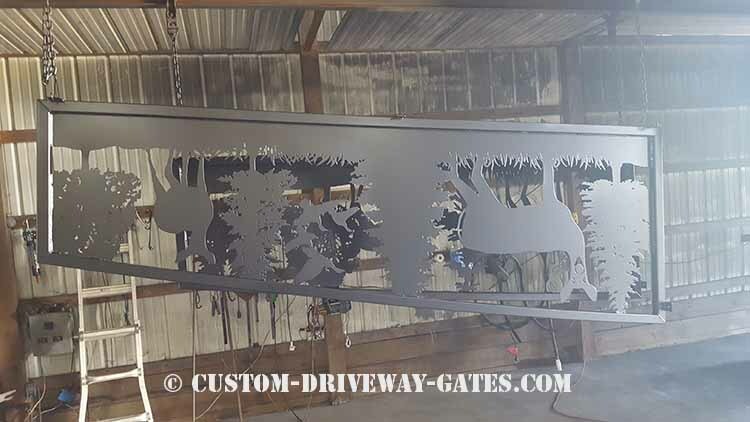 The panels feature a nature scene including deer, ducks, oak and pine trees, grass and an arched top to match the fall of the arch on the gates. 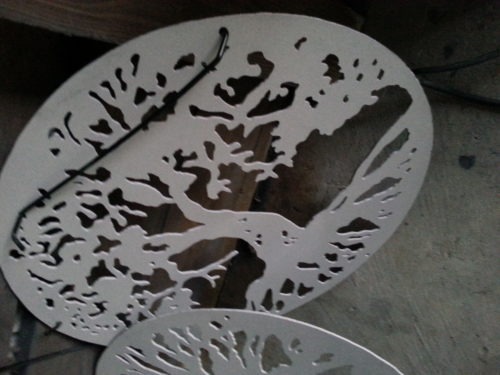 Pictured immediately after the powder coat was cured in the propane fired oven at 400F. 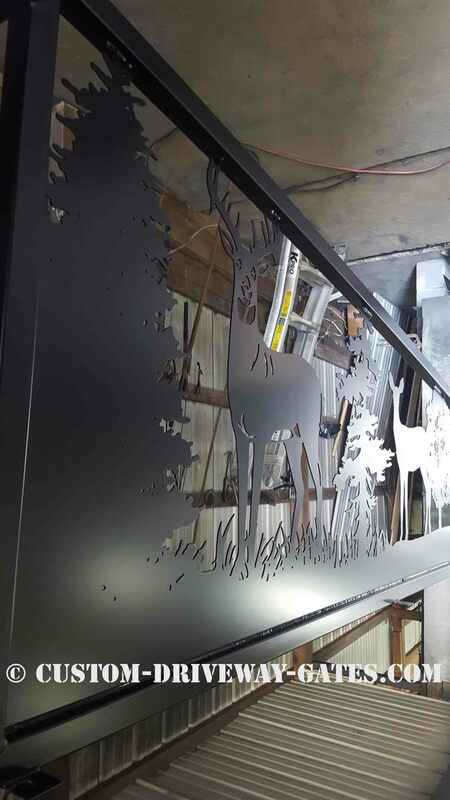 The semi gloss black powder coat is the top coat. Beneath the top coat is a layer of primer that consists of zinc rich epoxy. 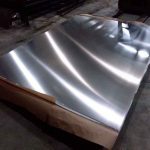 This zinc rich layer provides greatly enhanced long term corrosion resistance. The primer layer goes on first, then the panels are baked at 250F until the primer turns into a gel. Once the primer gels then the gates are pulled out and sprayed with the black top coat. Then back into the over to be baked at 400F for about a half hour. 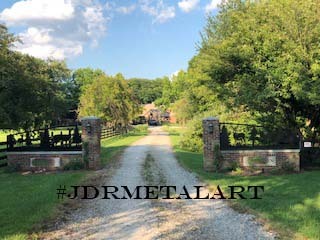 Once the gates cool they are fully cured and ready for many years of rust-free outdoor exposure. 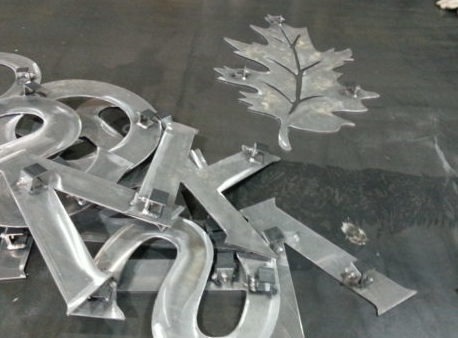 The finished product is much thicker than paint and smooths down any sharp edges. It also helps to fill in small surface imperfections such as scratches in the metal that paint would not cover. 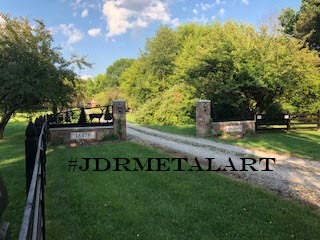 Here’s another custom Kansas City driveway gate project designed & built by JDR Metal Art. 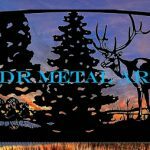 All welds are professionally done by a highly skilled welder. 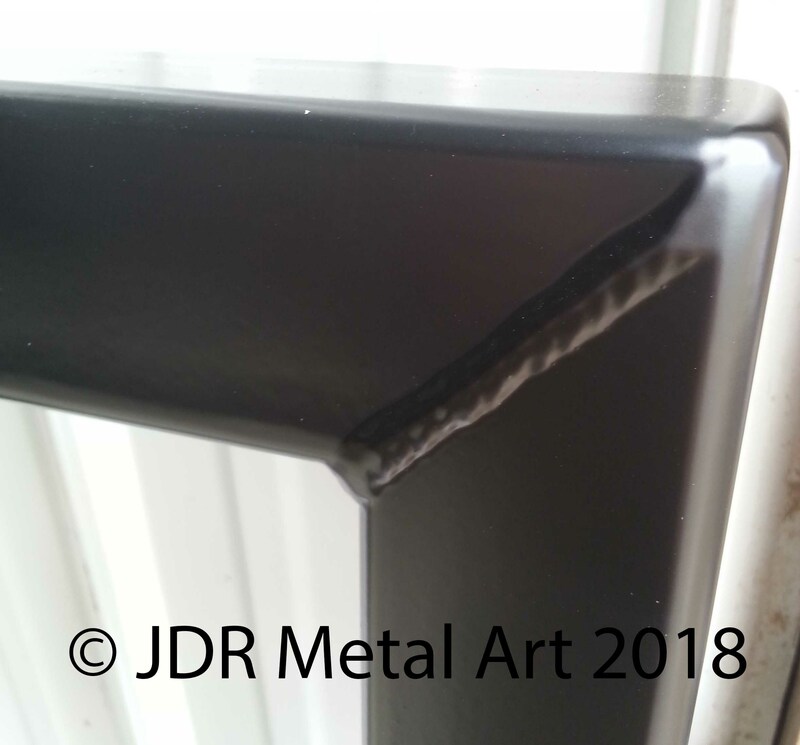 All frame joinery is also ground smooth in the corners for a beautiful and completely finished look. 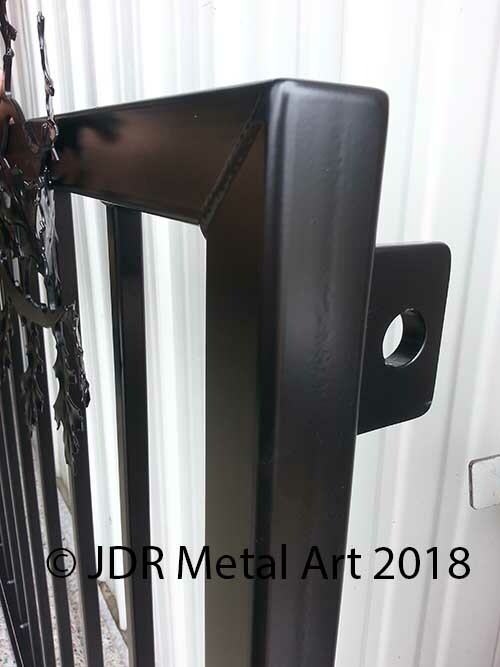 Hinge brackets are one of the crucial areas on any gate. They transfer all the force from the gate to the ground. 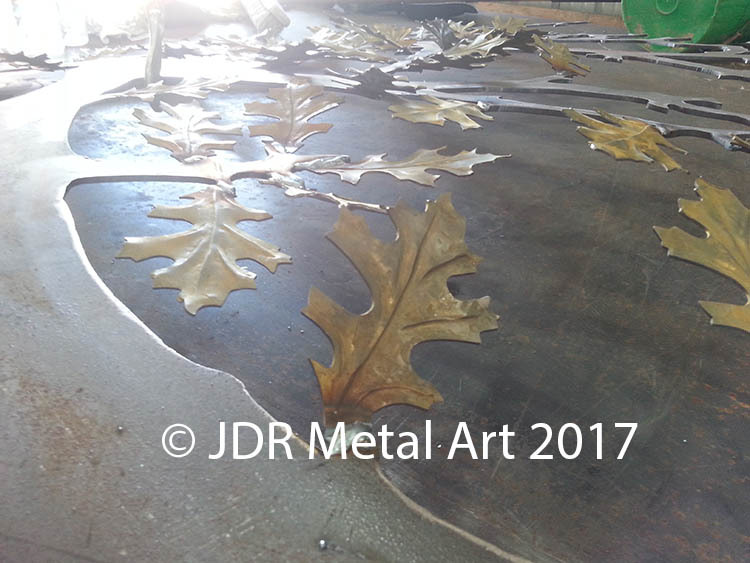 Each leaf is hand placed for maximum effect. 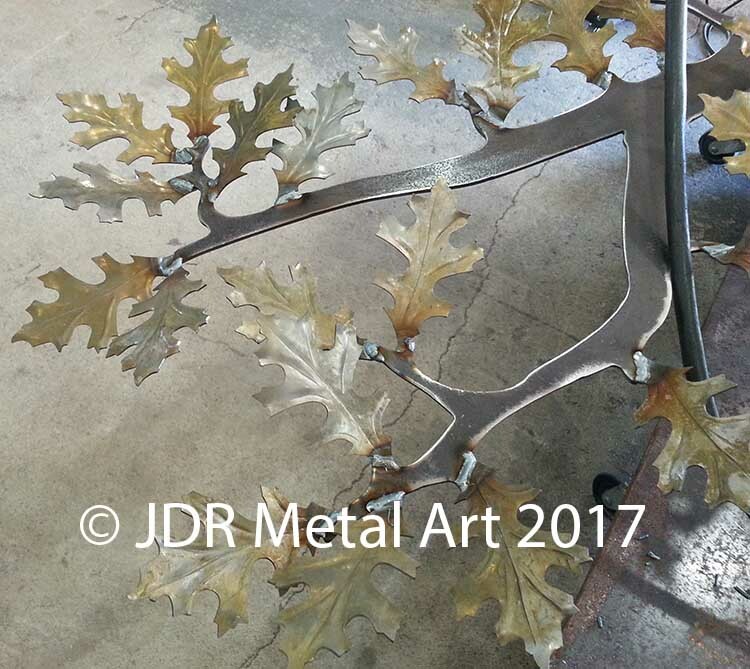 The leaves are welded solidly in place. 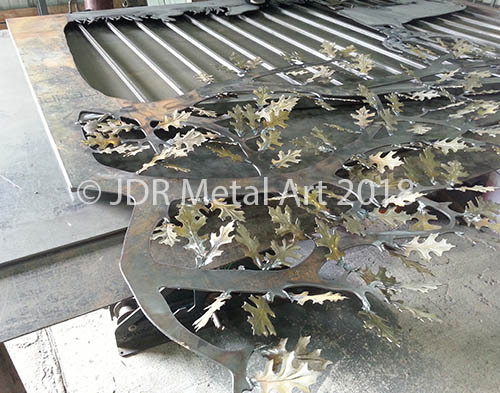 Here’s an interesting set of driveway gates currently in the works by JDR Metal Art. 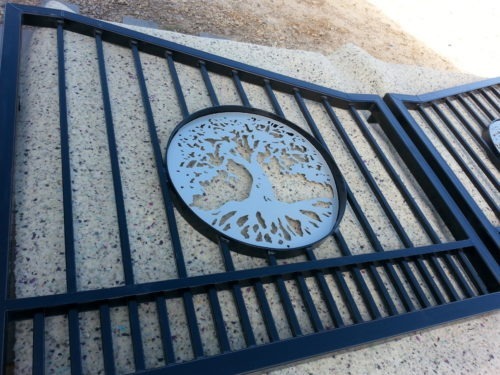 This project began at the custom design stage; our client really liked an oak tree driveway gate we built years ago and wanted to add something to it. 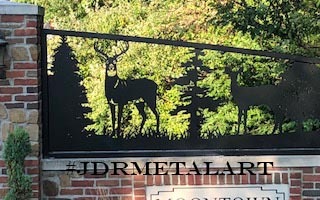 We modified the design by adding to it a wildlife scene which features a large whitetail buck on one side, a doe and two fawns on the other. 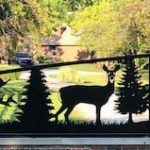 The deer are accompanied by two rabbits, a squirrel and a groundhog in the grass. 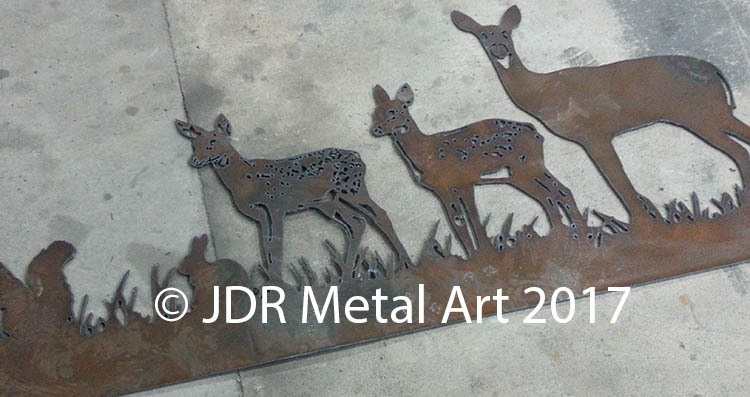 Here are the wildlife scene panels after the design stage was finalized and the plasma cutting was complete. 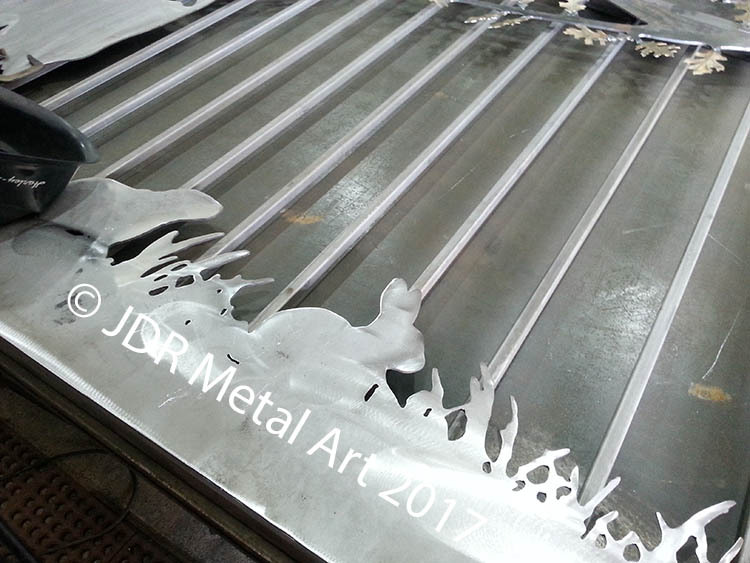 Here we’re getting the plasma cut sheets in place to secure them to the gate panels. 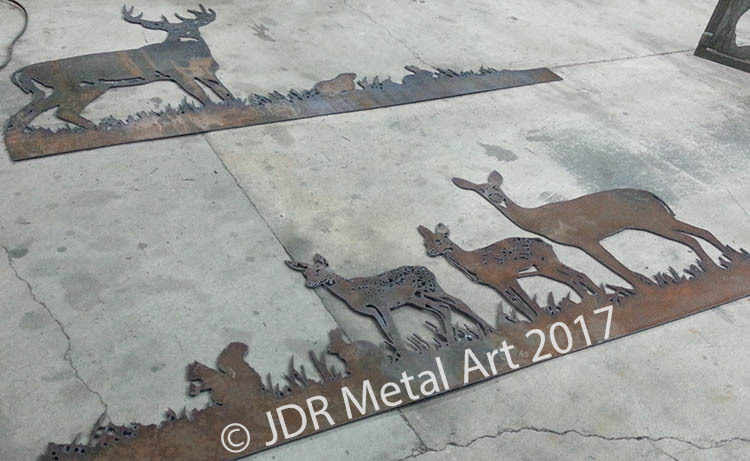 I cut the wildlife scenes separate from their respective halves of the tree to make handling much easier during the fabrication process. 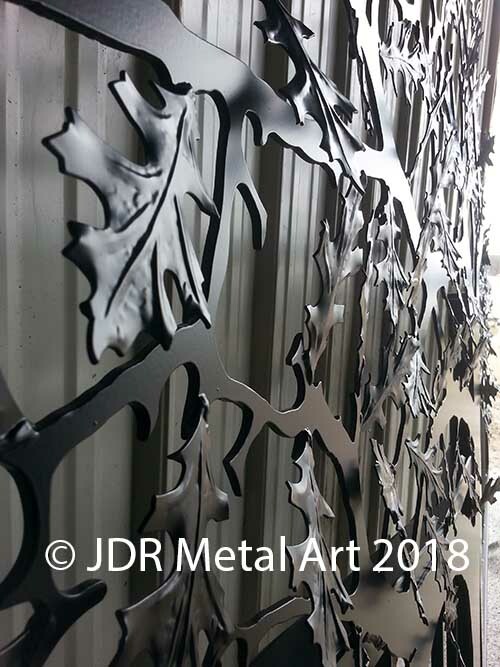 Each element of the plasma cut design is welded in place on each gate and will add both considerable strength and weight to each gate panel. 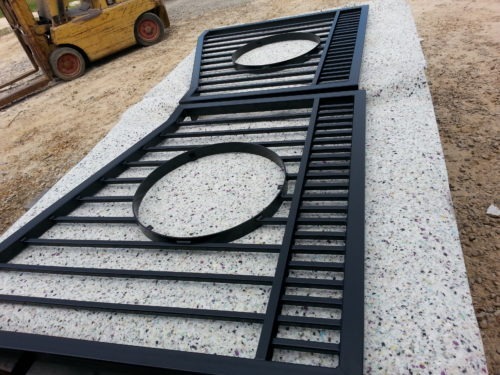 Each gate panel will hang from steel posts which will be encased within a rock column. 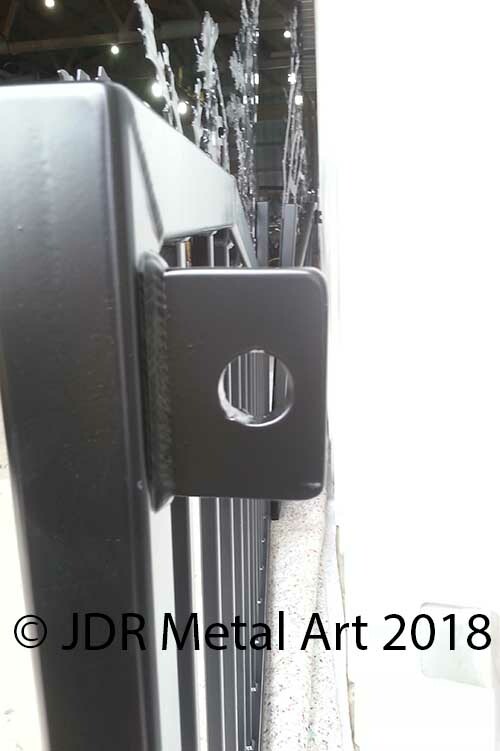 The super duty gate hinges attach to two arms which protrude from the encased posts out through the side of each column. Ready for a Free Quote? Contact Us Today! 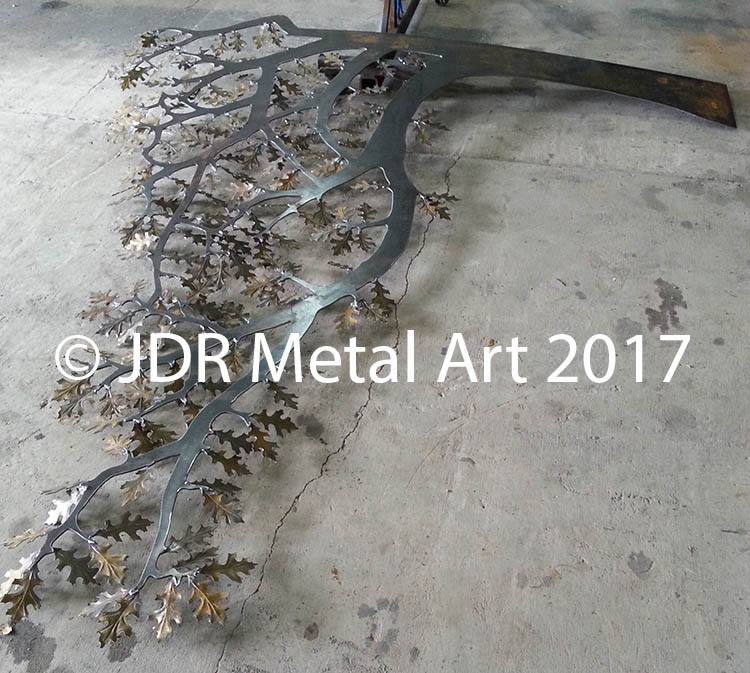 Here’s a “tree of life” gate we completed in 2017 for a Louisiana property developer. 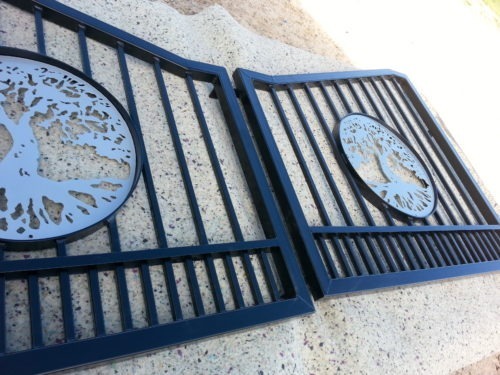 The frames for these gate are made from 2″ square tubing of mixed 1/8″ and 3/16″ wall thicknesses. The pickets are 3/4″ square tubing with 14 ga. wall thickness. The tree medallions were hand cut from 3/16″ marine grade aluminum. 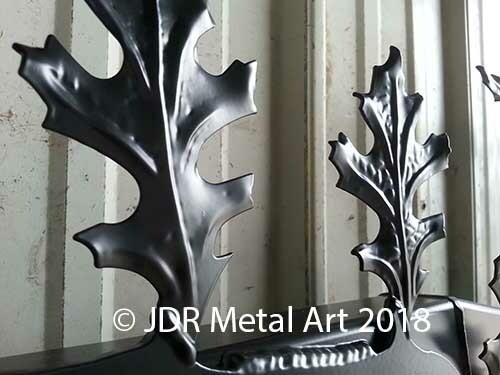 They were then powder coated with an aluminum powder coat finish for a tough, long-lasting finish that is much more environmentally friendly than paint. 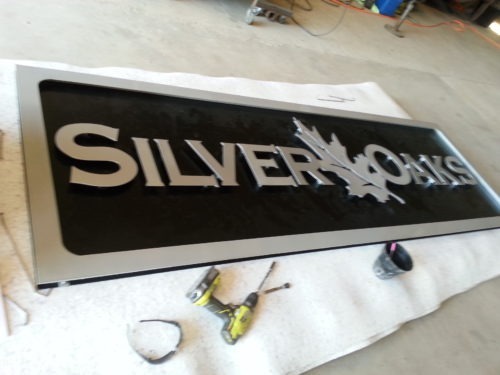 Here’s the completed sign, there is a second matching sign that went with it. 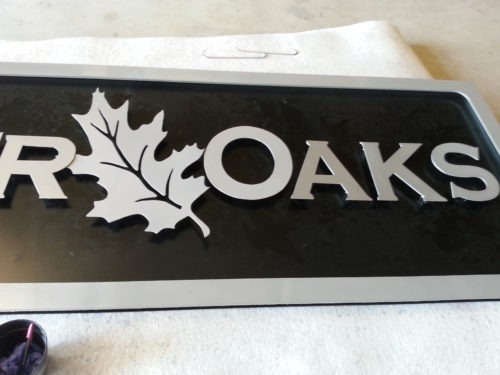 These signs are built from very durable materials, are professionally powder coated and will last for many years before needing any refinishing.